16:15 Check-in time at International Departures at OR Tambo. Please check your luggage through to Warsaw. 19:15 Depart on Emirates Airlines flight EK764. 05:15 Arrive in Dubai. Remain in transit. Change flights. 07:40 Depart on flight EK179 from Dubai. 10:55 Arrive in Warsaw, Poland. Clear passport formalities and collect your luggage. Pass through customs control and meet our representative who will assist you to your coach waiting in the designated parking area. Transfer to your 3* hotel and check in. Afternoon is at leisure to relax and rest. 19:00 Dinner at your hotel and overnight. 09:00 Depart from the hotel on a 3 hours guided tour of Warsaw. Highlights: The Old Town: The Royal Castle and the Royal Castle Square with King Sigismund III Vasa Column, St. John’s Cathedral, the Old Town Market Square and the Barbican. Imposing building of the Grand Theater of Opera and Ballet and the Tomb of an Unknown Soldier. The tour will end at the park where there is an impressive statue of Chopin for a photo opportunity. Concert at a church in Warsaw. Duration is 40 – 50 minutes and is strictly sacred and advent repertoire. 19:00 Dinner and overnight at your hotel. 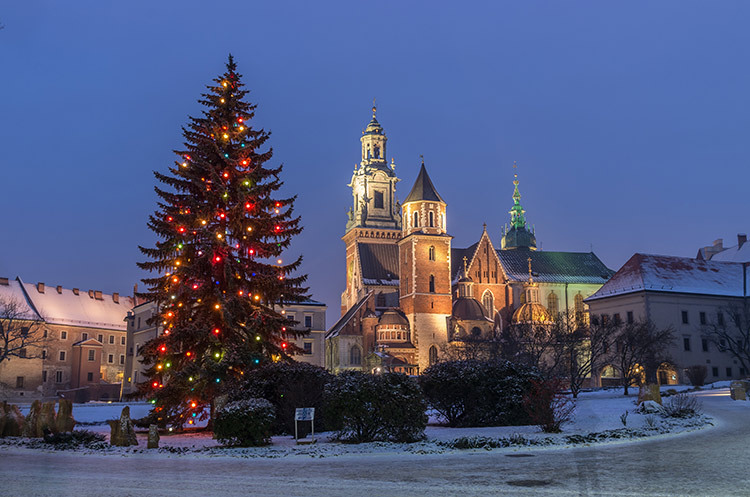 09:00 Depart from the hotel by coach to historic Krakow located 300 km’s – ± 4 hours away. Afternoon arrival and check in at your 3* hotel. The festival will take place in the Peter and Paul Church, Mariacki Church, as well as in churches in the Krakow region according to arrangement by the organisers. Joint concert of participating choirs – 20-minute program per choir. 20:00 Dinner at the old town restaurant and overnight at your hotel. Full day competition in categories entered, as well as extra concerts. 19:00 Dinner at the hotel and overnight. 09:00 Morning guided tour of Krakow. Highlights: Go around Krakow and see the Jewish District of Kazimierz, Wawel Hill, the Royal Castle, Collegium Maius, the Main Market Square, and St. Mary’s Church. Visit one of the oldest salt mines in Europe which has been in operation for at least 700 years. The oldest part of the mine is open to public as a museum. The Wieliczka Salt Mine was placed in 1978 on the UNESCO World Cultural Heritage List. Short 15-minute concert in a beautiful chapel 100 meters below the ground. 19:00 Gala concert with awards ceremony in the Mariacki Church. All choirs will perform 1 – 2 songs, regardless of the results. Dinner at a restaurant and overnight at your hotel. 09:00 Depart and travel along a beautiful mountain route to Zakopane – 60 km’s South of Krakow. Zakopane is set in a valley amongst the high Tatra Mountains. The population of Zakopane is 30 000 and the town is Poland’s leading holiday resort, both in summer and winter. Upon arrival we are going up mount Gubalowka by funicular railway. At the top there are lots of activities, including dry tobogganing. We have rented one snow sleigh for every 2 persons. A day to enjoy yourself in the snow. Late afternoon check in at your 3* hotel. 07:00 Breakfast at the hotel and check out. 15:00 Expected time of arrival at your 3* Atlas Hotel in Budapest and check in. A few hours at leisure to explore your surroundings. 09:00 Morning sightseeing tour of Budapest with English speaking guide. Budapest is a truly cultured European City. With the River Danube, the ring boulevards, its many eclectic and revival buildings, it is a pearl of Europe. Having preserved the old, human quality of days gone by better than many cities where development has swept the past away, it is a Sleeping Beauty still hidden from the eyes of Europe. You will be fascinated by the grand riverbank architecture, the Chain Bridge, Heroes’ Square, and Gellert Mountain. 14:00 Afternoon set-up and rehearsal. 16:00 Concert at the St. Stephan’s Cathedral in Budapest. Strictly sacred. 09:00 Depart for a visit to Szentendre. Just 15 minutes’ drive North of Budapest, with its red-tiled roofs, narrow alleyways, brightly painted houses and Orthodox churches built by the Serbians who settled there in the 17th century, Szentendre became and artists’ colony in this century and today hosts many festivals throughout the year. Folk crafts are demonstrated in and around traditional houses, churches, mills and other buildings. 30 miles before it flows through Budapest, the Danube River turns sharply to the south. We travel back to the 13th century as we climb high atop a hill in Visegrad to Solomon’s Tower, one of Central Europe’s largest and best preserved Romanesque castle keeps. With a commanding view of the Danube as it turns 90°, this spot was of strategic importance to the Romans, who also built fortifications here. Afternoon is at leisure in Budapest city. We suggest a visit to the Great Market Hall which is a restored neogothic hall for traders with grocery produce on the ground floor & souvenirs on the 1st floor. 07:00 Breakfast at the hotel. Pack the coach. 15:00 Expected time of arrival in Ljubljana. 16:30 Warm-up rehearsal and set-up at a church close to the hotel. Return to the hotel to change in concert dress. 18:00 Holy mass at the Cathedral of Saint Nicholas in Ljubljana. 19:00 Performance after the holy mass of sacred music. Max 1 hour. 20:30 Dinner at the hotel and overnight. 08:30 Morning visit to the local market where they sell fresh produce as well as arts and crafts. 14:00 Afternoon walking city tour and Funicular ride. This tour includes a walk past the major sights of the old part of Ljubljana and a funicular ride to Ljubljana Castle (Ljubljanski grad). The old city centre has a unique architectural appearance, particularly due to its mixture of Baroque and Art Nouveau architecture with masterful creations by the 20th century architect Joze Plecnik. The tour ends with a funicular ride to Ljubljana Castle, which departs from the Krekov trg square. 09:00 Depart by coach to Venice in Italy located 245 km’s south – about 3 hours. 12:00 Estimated time of arrival in Mestre, Venice. Check in at your 3* hotel with some leisure time in the area. Evening concert at a local church with sacred and advent music. 20:00 Dinner at a local restaurant and overnight at your hotel. Day 14. Venice – depart. 08:00 Breakfast at your hotel. Check out and load the luggage. 09:00 Board the coach and drive to the Tronchetto coach parking. 09:30 Board the boat that will take you to St. Mark’s Square. 10:30 Meet with a local guide and enjoy a guided walking tour of Venice. Visit St. Mark’s Square and learn the history that lies behind the walls of its most famous landmarks; the Basilica (entrance included) and its Byzantine heritage, the Doge’s Palace (entrance included) and its adjoining prisons, that retain the true secrets to comprehend how a city built on swamps became one of the most enlightened cities in the western world. 12:30 Depart with your coach to Venice airport. 13:35 Check in for your flight with Emirates. 15:25 Depart on flight EK136 to Dubai. You will receive a meal voucher for your stopover in Dubai with your boarding pass. 23:35 Arrive in Dubai. Change flights. Remember to use your meal voucher! Duty free shops are also open throughout the night. 00:15 Arrive in Dubai. Change flights. Remember to use your meal voucher! Duty free shops are also open throughout the night in the transit terminals. 04:40 Depart on flight EK761 from Dubai. 10:55 Arrive at OR Tambo airport after breakfast on board.